Today marks the debut of my strategy game design column “Gods at Play” at Game, Set, Watch. This week I talk about virtual viceroys and ceding power to the AI. So it’s great to be invited to contribute regularly. I struggled with the first one for a number of reasons personal and professional. If you’ve read Flash of Steel regularly over the years, you will probably see some themes and ideas recycled and updated at Gods at Play. As I troll my archives, I see a lot of design posts that need to be refreshed. 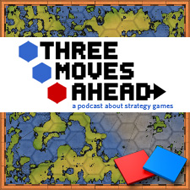 Three Moves Ahead has certainly helped refine my thinking. The column title image was designed by the inimitable Jennifer Sparks, who is responsible for all the amazing art I use. The column name was coined by the also inimitable Jenn Cutter, who is responsible for keeping me sane on those afternoons when the words do not come and I need to brainstorm. EDIT: Oh, and if you want to talk about the column, do it over there on GSW please or cross post your comment. Interesting first article. I would say that ultimately acceptance depends on how good the AI is: you’re much more likely to give up control if you can “trust” the decisions it makes. You can extend this to podcast topic Scourge of War: most of the units, whether superior or subordinate, are going to be controlled by the AI, and the success of the game as a whole depends on the how dependable (or not, historically speaking) they are on their own or when given vague orders. It seems like both of these games are trying, in some sense to do what Master of Orion was too afraid to do. Player attention is a resource, and I like the idea of a game that explicitly realizes this, and makes it a core design tenant. How different is HOI3 from EU3 in that regard? Have you put much time into Distant Worlds? I remember it being mentioned in a recent podcast, but haven’t see much else. Well, I know James Allen reviewed it . but was curious about Troy. I have put in some more DW time, but I’ve been so wrapped up in other projects that I’ve not had time to really gather all of my thoughts about the package. Paid work takes priority right now.